I like to cook salmon. It is delicious, nutritious, and easy to handle compared to other fish. 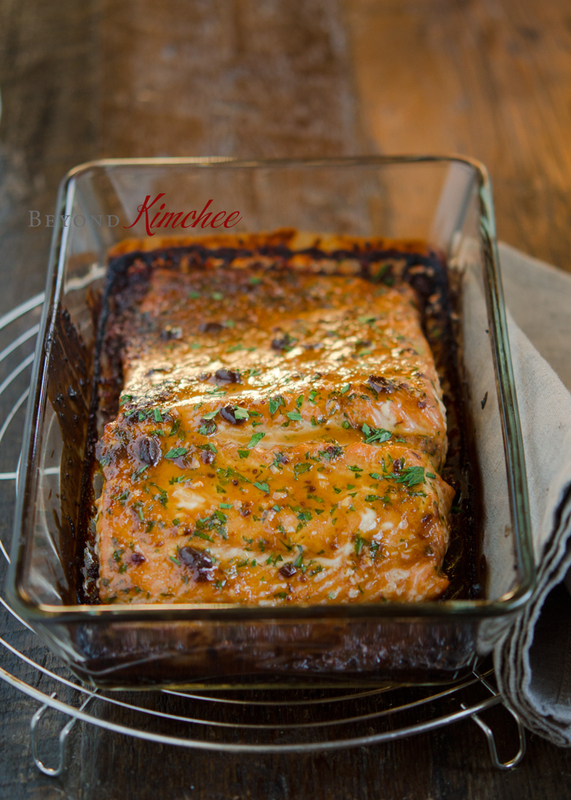 Here is one Korean-inspired recipe for salmon that is ridiculously easy and fast to prepare. I will call it soybean paste glazed salmon (된장소스 연어구이). Korean soybean paste is not just for Korean soups and stews. It is quite versatile and can be mixed with other kitchen staples to bring an exotic flavor to an ordinary dish, making it extraordinary. That’s my kind of kitchen adventure. 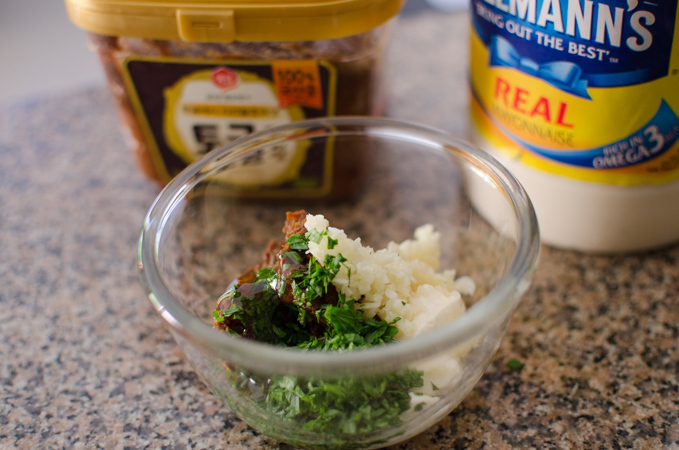 Mix soybean paste with mayonnaise, garlic, honey, and parsley. If you like a little heat, add a few dashes of hot sauce. 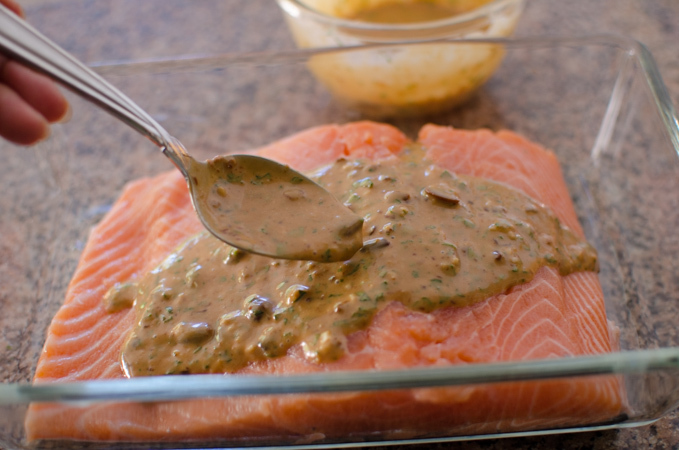 Place salmon on a greased baking pan and spread the sauce all over on top. 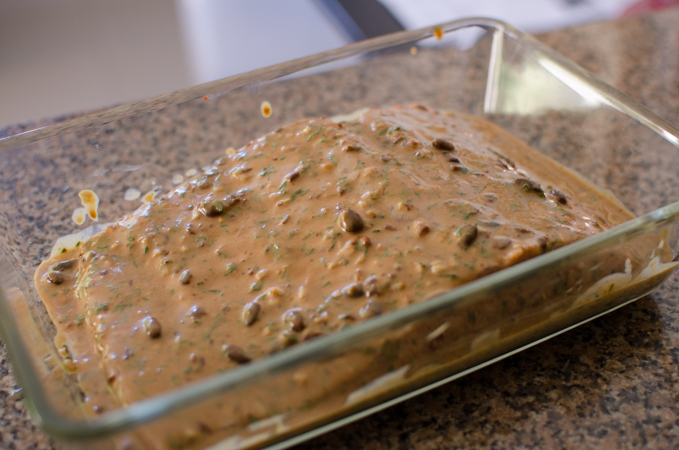 You can prepare this ahead of time and store in the refrigerator for up to 8 hours. Bake in the preheated 400˚F oven for 15 minutes or so. 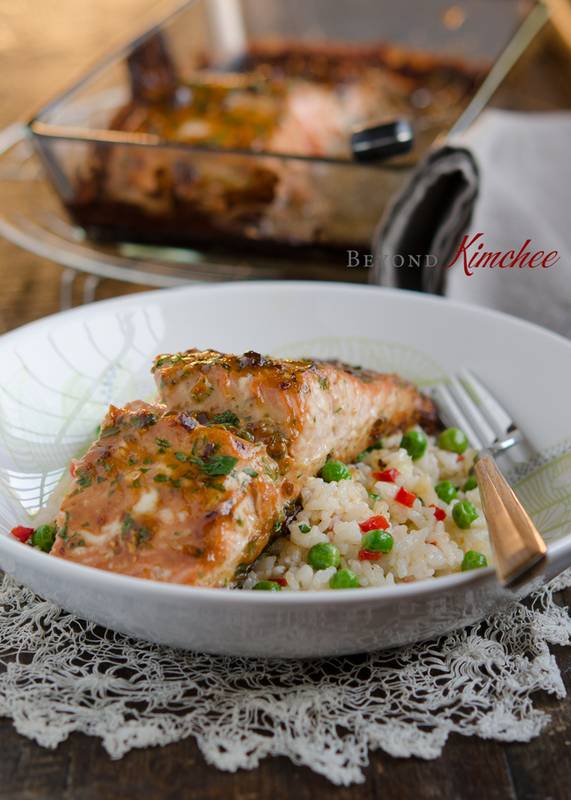 If your salmon fillet is very thick, you will need a bit more time to cook. I made some quick stir-fried rice with whatever vegetables I had and place the salmon on top. A delicious and healthy dinner without much fuss, our family dinner was served pleasantly. Yahoo~~! PS: Oh! By the way, I have launched a recipe blog written in Korean. It is called Savory Good Life. Please feel free to stop by if you are interested. Place salmon fillet on a greased baking dish. To make the sauce, combine the rest of the ingredients in a small bowl; mix well. Spread the sauce over the salmon. Bake for 15-18 minutes and serve hot with rice. Love salmon! And what a terrific glaze for it -- loads of flavor. And the dish looks so nice, too. Great job -- thanks. Do you purchase the salmon with skin on? If so, do you peel the skin off before cooking salmon? You can use either one. I usually buy the salmon with the skin on, clean and wash well, then wipe out the moisture. I don't eat the skin, though. The skin is facing down to the pan and I don't put the sauce on the skin. We eat a lot of salmon so would definitely like to try it out. Do you think the mayonnaise could be omitted? We hardly ever have any in the house as I don't really use it. Try with plain yogurt. I have not tried with it yet, but it might work. That salmon looks gorgeous! What a great way to change things up. Holly, I love this recipe! 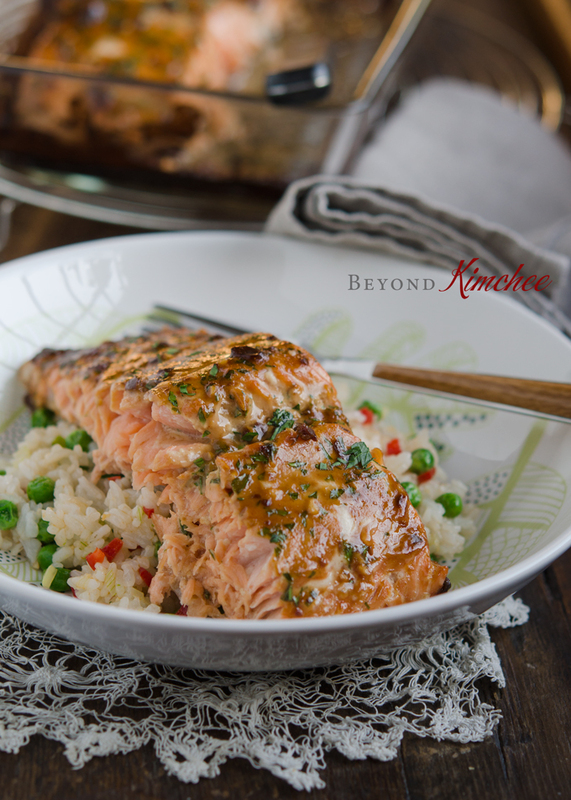 I love finding new ways to prepare my salmon! will definitely try this! and Congrats on the Korean blog!!! wow!!! so cool! Thanks! I am same with you. I always look for a different way to enjoy salmon. Hope you can give it a shot! This looks delicious! I've got a container of miso in my fridge, at all times, and am constantly on the lookout for finding new/more ways to use it. This is definitely on the menu. My Korean friend gave me a tub of seasoned soybean paste, and I stumbled across this receipe googling ways to use it on salmon. This was AMAZING! Thank you. I hope to use many more of your recipes :) Ever since my friend invited us over for Korean BBQ, I've been obsessed. That is so wonderful, Jennie I am glad that you like this salmon. It is one of my favorite way to cook salmon. Hope you can find more delicious dishes to use up the paste.